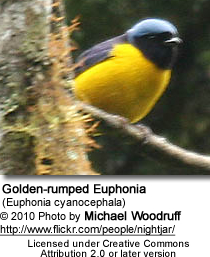 The Golden-rumped Euphonias (Euphonia cyanocephala) - also known as Black-necked Euphonias or Blue-hooded Euphonias - are finches with a wide distribution across South America. They are endemic to Argentina, Paraguay, Brazil, Bolivia, Peru, Suriname, French Guiana, Guyana, Venezuela, Colombia and Ecuador; and the island of Trinidad. They live in subtropical or tropical moist lowland and montane forests, as well as heavily degraded former forest. Range: Sierra de Perijá (on the Colombia–Venezuela border); Venezuela (Andes, coastal cordilleras, and southeastern Bolívar); through central Guyana, French Guiana and Suriname; the island of Trinidad; the Andes of Colombia (except southern areas). May also occur along the eastern slope in Ecuador. Occur on the eastern slope in Peru south to Bolivia (including the extreme eastern Santa Cruz). Also northwestern Argentina (south to Tucumán). North central and south central Brazil. Southeastern Brazil (Bahia, southern Goiás and Mato Grosso, south to Rio Grande do Sul); southeastern Paraguay and northeastern Argentina (west to eastern Chaco). Euphonias are known for their almost constant singing. Their best known calls sound like "Pe-we," "see-see."